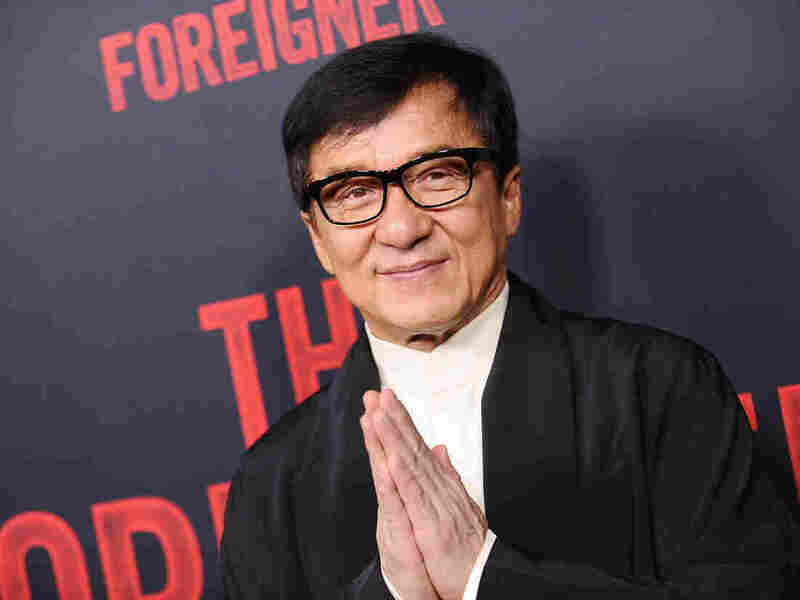 Jackie Chan Jumps Back Into The Action With 'The Foreigner' Though he said he was retiring in 2012, the actor is back in The Foreigner, his first American action movie in seven years. But what he really wants is to "make a drama film without one punch." Jackie Chan attends the premiere of The Foreigner last week in Hollywood, Calif. When audiences watch a Jackie Chan movie, they know exactly what they're in for — lots of punching — but there's something that might surprise people about the actor. "I hate violence," Chan says. "But I make action films." Chan got his start in his native Hong Kong as a low-wage stuntman, working on films with the legendary Bruce Lee. For over five decades in the movie business, he has crashed through glass, tumbled down stairwells and landed on moving trucks. It's the kind of work that Hollywood doesn't typically honor, but he's made a mark that's hard to ignore. Last year, the 63-year-old star received an honorary Oscar. "That means to me, just like complete my life. I only make cheap action movies, comedy," Chan says. "I never thought I could get an Oscar." I think after Bruce Lee died, and those kind of action movies [were] so popular, and they cannot find enough action stars. Even myself — all the acting, all the skill, all the kicking, just like Bruce Lee. You have to [be] exactly like Bruce Lee, the face, the look, all Bruce. Even my name, "Second Bruce Lee, Jackie Chan," when you'd see the poster. ... I'm not happy. In the poster, you'd never see my name, you see only BRUCE LEE, Jackie Chan. I'm very lucky. There's a producer [that] called me up and said "Let's do something different." I said "OK, let's do some comedy." From the castle, I jumped to the middle of the tree. The tree bent to another castle. Between the castle, that's about 35-40 feet high, but I jumped, the tree break. Break, break, break break ... then I was just landing on my back, my head. The rock immediately hurt my skull. I just asked myself "If I die, what [have] I done for this world?" OK, making a movie, fooling around at night, crashing a car in the morning, buy another car in the morning. At night, crash another one. ... Then I said, "If I can survive, I have to do something for the world." I really, really hope one day I can make a drama film without one punch ... Even in China, difficult. They're just not used to it, to see Jackie, slow-motion on the beach, kissing the girl. I like to do that, but nobody hire me! I've been doing martial arts for 57 years, every day in the studio fighting, teaching people how to fight. And I always ask myself: When I should stop, when should I retire? ... Because I'm not as fast as before. I'd rather be an actor who can fight, not the fighter who can act. Probably you can see my Chinese films, when I go back to my own country, I can do whatever I want. I can do a drama, I can do comedy, I can do action, I change. ... Here, I always receive the script: Police from Hong Kong, police from China, CIA from Hong Kong, CIA from China. Always Rush Hour 1, Rush Hour 2, Rush Hour 3. Then, Shanghai Noon, Shanghai Knights. Can I have something different? ... I really, really hope one day I can make a drama film without one punch. Even in China, difficult. They're just not used to it, to see Jackie, slow-motion on the beach, kissing the girl. I like to do that, but nobody hire me! This story was edited for radio by Shannon Rhoades and Danny Hajek, and adapted for the Web by Sydnee Monday and Petra Mayer.